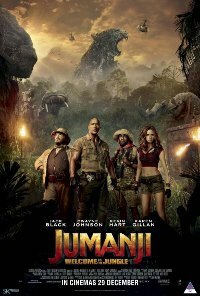 When four teenagers in detention discover an old video game console with a game they’ve never heard of, they are immediately thrust into the game’s jungle setting, and into the bodies of their on-screen characters. What they discover is that you don’t just play Jumanji... Jumanji plays you. They’ll have to go on the most dangerous adventure of their lives, or they’ll be stuck in the game forever. This film is releasing in 2D, 3D and 4DX. This is the 3D version.